Hydrangea — loving plant. To grow it in the Urals, it is necessary to choose the most winter-hardy species and varieties and to adhere to certain rules of agricultural technology. Only in this case it will delight you with a rich and long flowering. For landing on the territory of the Urals are not suitable for all types of hydrangeas. It is best to tolerate winter frosts paniculata, can grow for several years and tree, but large, oakleaf, garden (loose leaf), petiolate experts do not recommend to plant, although they can be grown as pot culture. Pick a suitable place on your site. Hydrangeas need full sun or partial shade, and the area with plantings must be protected from the wind. As this protection can be a house wall, fence or planting of conifers. Hydrangea loves nutrient substrate, rich in humus. If the area has clay soil, it is necessary to make the substrate independently. Dig a fairly large planting hole. Mix leaf mold, peat (you can substitute well-rotted compost, add a small amount krupnoporistogo sand. The plant does not tolerate excess potassium, so you should not make ash and lime. Planting in the Urals should be carried out in the spring, when the threat passes the return of frost, when buying, pay attention to the ground ball was wet. Carefully remove the plant from the container with the roots spread. The soil in the landing pit moisten it and put the seedling on top pour all the nutrient substrate. Again all wet over mulch and humus. Looks very nice hydrangea Bush as a specimen on the lawn. But if you want to plant some plants, keep seedlings at a minimum distance of 1.5 m to each other. Hydrangea is a very hygrophilous. 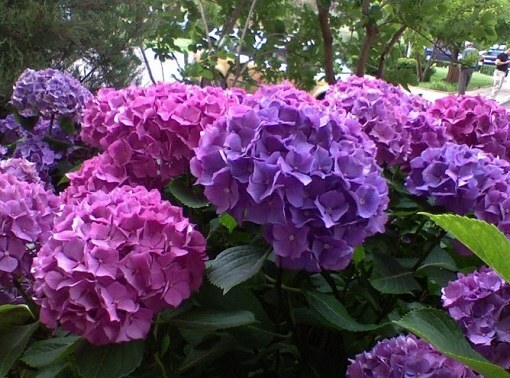 During rainy periods watering is not necessary to carry out, but in the dry summer, which is quite often in the Urals, water hydrangea profusely as drying of the soil. Throughout the season do 3 feedings in a month complex fertilizers, but in the second half of the summer, try not to fertilize with products containing nitrogen, because in this case it narastit shoots that will not have time to ripen before the cold weather. Also, experts suggest watering 2 times per season with an acid solution. To do this, dilute the freshly squeezed juice of one lemon in five liters of water and pour over the bushes. This technique will slightly acidify the soil, which is necessary for growth and excellent development of the plant. You can also add if needed, coniferous litter or bark. In the first 3-4 years, the bushes don't need to crop. But subsequently, hydrangea pruning is necessary. Cut away all faded blossoms and branches growing inside the Bush. In the spring remove any frozen and broken branches. After the onset of the first frosts cover the Bush. If the plant is small, then bend the branches to the ground, press them and cover with spruce branches. If the hydrangea is large enough, then fill the apical part dry leaves, and shrub cover with agrotextile. In the winter throw on the plant as much snow.